For the publication, see BoxOffice (magazine). By extension, the term is frequently used, especially in the context of the film industry, as a synonym for the amount of business a particular production, such as a film or theatre show, receives. Box office business can be measured in the terms of the number of tickets sold or the amount of money raised by ticket sales (revenue). The projection and analysis of these earnings is very important for the creative industries and often a source of interest for fans. This is predominant in the Hollywood movie industry. Look up box office in Wiktionary, the free dictionary. The term is attested since 1786, presumably from sales of boxes (private seating areas in a theatre). The sense of "total sales" is attested from 1904. A folk etymology is that this derives from Elizabethan theatre (i.e. late 16th century), where theatre admission was collected in a box attached to a long stick, passed around the audience; comparable to "bottle" in Punch and Judy, where money was collected in a bottle. However, first attestation is about 200 years later, making this highly unlikely. There are numerous websites that monitor box-office receipts, such as BoxOffice, Box Office India, Box Office Mojo, Koimoi, ShowBIZ Data and The Numbers which provide detailed information for many movies but have less and incomplete data for older movies due to the history of how box office reporting evolved, especially in the U.S., and the availability of this information prior to the introduction of the internet. Although other publications have published box office data over the years, the longevity and regular reporting of Variety makes it a significant source for older box office reporting for the US market and US films. During the 1920s, Variety reported box office grosses for films by theatre for certain U.S. cities. In 1946, they started to publish a weekly National Box Office survey on page 3 indicating the performance of the week's hits and flops based on the box office results of 25 key U.S. cities. During the 1930s, Variety published charts of the top performing films of the year and has maintained this tradition annually since. In 1946, they published a list of All-Time Top Grossers with a list of films that had achieved or gave promise of earning $4,000,000 or more in domestic (U.S. and Canada) rentals. They would publish an updated all-time list annually for over 50 years, normally in their anniversary edition each January. The anniversary edition would also normally contain the list of the top performing films of the year. Some publications such as BoxOffice magazine published box office performance expressed as a percentage compared to regular films Some of the early annual reports from Variety also used this format. From the 1930s, BoxOffice magazine published a Barometer issue in January giving the performance of movies for the year expressed as percentages. The first issue of The Motion Picture Almanac in 1929 also used this format to rank money makers. In the late 1960s, Variety used an IBM 360 computer to collate the grosses from their weekly reports of 22 to 24 U.S. cities from January 1, 1968. The data came from up to 800 theatres which represented around 5% of the U.S. cinema population at the time but around one-third of the total U.S. box office grosses. In 1969, they started to publish the computerized box office compilation of the top 50 grossing films of the week based on this data. "The Love Bug" was the number one in the first chart published for the week ending April 16, 1969. The chart was discontinued in 1990. In 1976, Marcy Polier, an employee of the Mann theater chain, set up Centralized Grosses to collate U.S. daily box office data on a centralized basis rather than each theater chain collating their own numbers from other theater chains. The company later became National Gross Service then Entertainment Data, Inc. (EDI). Except for disclosures by the studios on very successful films, total domestic (U.S. and Canada) box office gross information for films was not readily available until National Gross Service started to collate this data around 1981. The collation of grosses led to wider reporting of domestic box office grosses for films. Arthur D. Murphy at Variety was one of the first to organize and chart that information and report it in a meaningful form. During the 1980s, Daily Variety started to publish a weekly chart of the domestic box office grosses of films as compared to the Top 50 chart in Variety which was based on a sample of key markets. Gradually the focus of a film's performance became its box office gross rather than the rentals that Variety continued to report annually. Prior to the tracking of these grosses, domestic or worldwide box office grosses is not available for many earlier films so the only domestic or worldwide data available is still often the rental figures. In 1984, EDI started to report Canadian grosses as well and by 1985 was reporting data for 15,000 screens. In 1987, EDI set up a database of box office information which included data on certain films back to 1970. By 1991, all U.S. studios had agreed to share their complete data reports with EDI. In 1990, EDI opened an office in the UK, moved into Germany in 1993 and Spain in 1995 reporting box office data for those markets. EDI were acquired by ACNielsen Corporation in 1997 for $26 million and became Nielsen EDI. In December 2009, with its acquisition of Nielsen EDI for $15 million, measurement company Rentrak became the sole provider of worldwide box office ticket sales revenue and attendance information which is used by many of the websites noted above. For a list of films which are major box-office hits, see List of highest-grossing films. Films that are considered to have been very unsuccessful at the box office are called box office bombs or box office flops. For a list of these films, see List of box office bombs. Theaters is the number of theaters in which the movie is showing. Since a single theater may show a movie on multiple screens, the total number of screens is used as another measure. The theaters measure is used to determine whether a film is in wide release, meaning at least 600 theaters, or limited release which is less than 600 theaters. Occasionally, a film may achieve wide release after an initial limited release; Little Miss Sunshine is an example of this. Gross refers to gross earnings. On average, the movie's distributor receives a little more than half of the final gross (often referred to as the rentals) with the remainder going to the exhibitor (i.e., movie theater). Multiple is the ratio of a film's total gross to that of the opening weekend. A film that earns $20 million on its opening weekend and finishes with $80 million has a multiple of 4. From 2004 to 2014, films viewers graded as A+ on CinemaScore had a 4.8 multiple, while films graded as F had a 2.2 multiple. 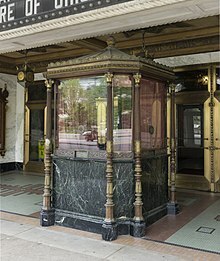 Wikimedia Commons has media related to Box offices. ^ "How Box Office Reporting Was Built". ^ "Six Best Money Stars". Variety. January 5, 1932. p. 1. ^ ""A Man's Castle" Reissue Proves Best Draw". BoxOffice. July 2, 1938. p. 32. Retrieved April 23, 2018. ^ "BoxOffice Barometer A Review of 1947 A Preview of 1948". Retrieved April 23, 2018. ^ 104 Money Makers. The Motion Picture Almanac. ^ "Variety's Grosses Report". Variety. February 14, 1990. p. 5. ^ Benson-Allott, Caetlin (2013). Killer Tapes and Shattered Screens: Video Specatorship from VHS to File Sharing. University of California Press. p. 149. ISBN 9780520954496. ^ Hindes, Andrew (November 18, 1996). "Number's Game". Variety. p. 43. ^ Hindes, Andrew (November 18, 1996). "Outfit keeps tabs on overseas pic sales". Variety. p. 48. ^ Gunderson, Laura (February 8, 2010). "Portland-based Rentrak posts Q3 loss". The Oregonian. Retrieved February 9, 2010. ^ "Rentrak buys Nielsen EDI, consolidating box office reporting business". The Los Angeles Times. Retrieved April 9, 2011. ^ Cones, John W. (1997). The feature film distribution deal: a critical analysis of the single most important film industry agreement. Southern Illinois University Press. p. 41. ISBN 978-0-8093-2082-0. ^ "Office Tracking by Time". Box Office Mojo. Retrieved 2010-01-12. ^ Busch, Anita (August 9, 2014). "B Grade For 'Turtles': What CinemaScores Mean And Why Exit Polling Matters". Deadline Hollywood. Retrieved August 20, 2014.